(12 June 2013) The lessons "Continuous spatial variables" and "Accessibility" (on basic level) are now available in English! And we have a new case study, the "Mountain goats and bighorn sheep in Yellowstone NP"
(14 January 2013) ESRI simplified the procedure to get a free 1-year full license "ArcGIS for Desktop Student Trial". How to get it is described here (for students in Switzerland only). (December 07th 2009) Student licenses of ArcGIS Desktop 9.3.1 are now available. More information on conditions and ordering can be found here. 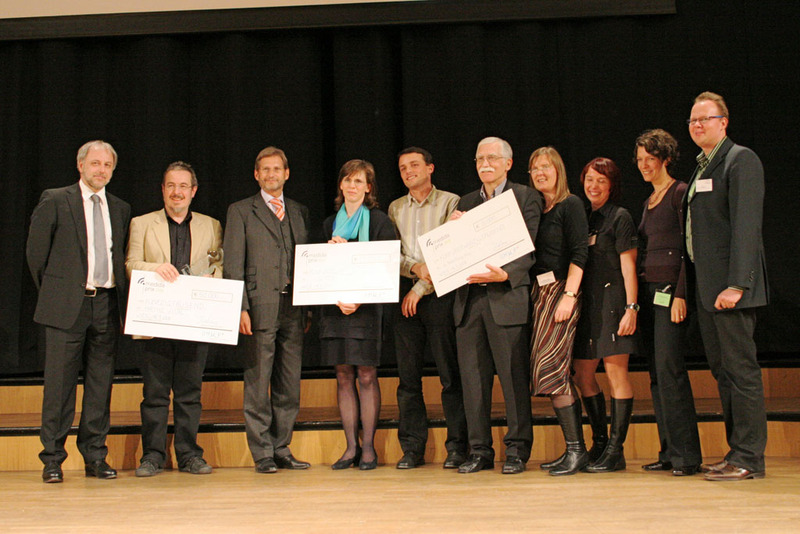 (September 18th 2008) GITTA has finished on second place at this year's MedidaPrix, a prestigious award for projects implementing the use of new learning technologies in higher education in Germany, Austria and Switzerland. The prize money of Euro 100,000 was split into three parts: The winner MatheVital receives Euro 50,000, and us as well as third place e-teaching.org receive Euro 25,000 each. The award is the result of the work of many people. We'd like to thank all of you who contributed to the project in one way or the other. (August 11th 2008) From now on, subscribing to the GITTA newsletter gives you full access to the contents of the CartouCHe project as well. Find an overview of the available content here. (July 3rd 2008) We are happy to announce that GITTA has reached the final round of MedidaPrix 2008. This means that we are one of 19 finalists of a total number of 77 candidates that all achieved the formal criteria. (October 24th 2007) The GITTA association would like to proceed a workshop with focus on "Exchange of Experiences in e-Learning and Curriculum Integration". In order to help us with the organization of the logistics, we would appreciate if you could indicate your interest in attending this workshop by casting your vote on the following Doodle poll. (July 18th 2007) ESRI offers one year site licences of ArcGIS Desktop 9.2. The order form can be downloaded here. (January 3rd 2007) The first meeting of the steering committee responsible for the new GITTA Association will take place on January 17th 2007 at the University of Zurich. The GITTA newsletter will inform about outcomes and news as soon as possible. (November 21st 2006) On November 16th 2006 the association for promoting GITTA (in German "Föderverein") was founded at the Institute of Geography of the University of Bern. This new GITTA Association is open to every active member or sponsor interested in using, updating and/or promoting GITTA materials. The statutes, membership fee, contact person etc. can be found on the GITTA Association page. A redesign of the GITTA website in 2007 will hold extensive information about this new association and about how the project members will work together in future. (November 3rd 2006) We are very happy to announce that with the release of the "Spatial Modeling Module" (containing 5 lessons in French) the GITTA basic level is fully online and available without any limitations. Furthermore, intermediate lesson 1 and 2 (both in English) of the "Spatial Analysis Module" have been put online today. Please register to our newsletter to get our "Full Access Link" and have a look at the new lessons. (May 30th 2006) All GITTA lessons available as open content can now be downloaded as ZIP archives in both the IMS Content Packages and the SCORM format. These content packages can directly be imported into any learning management system (LMS) supporting one of these popular standards. On the content package download page you can find the zip files and an installation tutorial movie for both OLAT and WebCT, two widely used LMS. The layout used is kept plain, no chapter numeration and navigation elements are used, since these parts will be provided by the LMS. If you tried out one of our content packages, we kindly request to provide us a short feedback including the LMS you are using, version and experiences. Thank you very much. Older GITTA news can be found in our archive. (October 18th 2006) In 2006 we opened the project to the public and released our lessons under the Creative Commons license freely for non-commercial purposes. Now we continue our "opening strategy" and change the legal form: The existing consortium of ten partner institutes will be dissolved and a new "GITTA Association", accessible to every interested person or organisation, will be established. We would like to invite interested circles to take part in the future growth of the GITTA project both with respect to content and quality. The new GITTA Association will be open to interested persons and organisations and allow them to become an active member or a sustaining member (individual or organisation). Sustaining memberships are directed to persons and organisations, who are using GITTA and/or would like to support the purpose of GITTA. The founders meeting will be held on Thursday November 16th, 2006 at 7pm at the University of Berne: Department of Geography of the University of Berne, Hallerstrasse 12, CH-3012 Bern, Room 302. You can download the statutes draft here (in German only). (July 6th 2006) On July 5th GITTA was presented at the AGIT conference in Salzburg (Austria) by the coordinator Joël Fisler. The presented publication (Fisler et al. 2006) and the presentation itself can both be found on the GITTA conferences page. The paper was published by the Wichmann-Verlag in the AGIT Fachtagung "Geoinformation in der Schule" proceedings entitled "Lernen mit Geoinformation". (July 4th 2006) Today the first intermediate and all the basic data capture lessons have been released. Please have a look at the lesson overview page for a complete list of all available lessons. (April 26th 2006) After the release of the first GITTA basic lessons under the creative commons license we plan to present our project at various conferences. The GITTA Coordinator Joël Fisler will be in May at the 2nd "GIS-Ausbildungstage" in Potsdam (Germany), in July at the Austrian AGIT in Salzburg and in September at the EUGISES conference in Poland. You can find a list of all conferences including the download-links for the papers and the conference website links on our conferences page. If you are also participating at one of these conferences and would like to meet the coordinator to discuss possible cooperations or have other questions, feel free contact Joël Fisler before the conference. (February 13th 2006) The GITTA lessons are finally available for free under the creative commons license. This means that you can use, copy, distribute, translate or even make derivative works of our lessons under the following conditions: Non-commercial use only, GITTA has to be cited as author of the lesson (Attribution) and derivative works have to distributed under the same license (Share Alike). Please have a look at the legal code and if you agree continue by subscribing our newsletter for full access to all lessons. 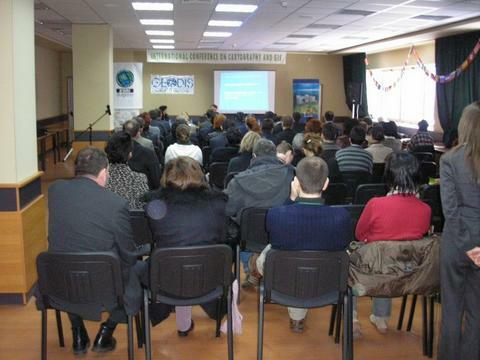 (January 30th 2006) The GITTA project was presented during a (unfortunately poorly visited) poster session at the first International Conference on Cartography and GIS in Borovets (Bulgaria). Hopefully this presentation will help finding new partners within Europe. You can download the poster on the conference page. (November 29th 2005) ESRI Switzerland informed us that the ArcGIS 9.1 "GITTA students bundles" boxes have arrived. The boxes include a full version of ArcView 9.1 including Spatial Analyst, 3D Analyst and Geostatical Analyst (with PDF Tutorials etc.) and more. Students and tutors using GITTA can apply for a unlimited one year license, all other GITTA users will receive a two-month try-out version. For more information visit our GIS software page. The presentation hold at the ICA CET Meeting can be found on the GITTA conference page. Interested? For further information on ICA CET and GITTA in Swiss Cartography, please contact: Marion Werner at the Institute of Cartography of the Swiss Institute of Technology. (June 6th 2005) Two conferences took place at the Geoforschungszentrum (GFZ) Potsdam: The ISPRS Workshop about "Tools and Techniques for E-Learning" and the DDGI Tagung about "Innovationen in Aus- und Weiterbildung mit GIS". On Thursday the eLML paper about "Development of sustainable e-learning content with the open source eLesson Markup Language eLML" (Fisler et al. 2005) was presented by Joël Fisler to the ISPRS members, on Friday over 100 conference participants listened to the talk about GITTA and its plans to release lessons under an open license. The paper and both presentations can be found on the GITTA conference page. (May 20th 2005) Today the GITTA Newsletter was introduced. Please use the form on the left (below the Menu) to get subscribed. There is also a detailed information page to login and to access the archive. This is a low traffic list. Subscribers will not get more than one mail per month. (May 12th 2005) The new SVC questionnaire for the summer semester 2005 is available in German, French and Italian. Students from any partner institute using GITTA this semester should fill out questionnaire until the end of the semester. (April 25th 2005) Last week the GITTA consortium decided to release all 50 lessons and 10 case studies under the creative commons license. This means that GITTA content will be available freely for non-commercial use. First lessons are planned to be available in late summer. Before being opened all copyright issues have to be solved. Furthermore we are waiting for the final version of the Swiss Creative Commons license. (December 1st 2004) eLML, the eLesson Markup Language, that evolved out of the GITTA project, now became an independent Sourceforge OpenSource Project with its own www.eLML.ch and eLML Sourceforge website. For interested developers we offer newsletter, forums, bug tracker, CVS- and Binary-downloads etc. Subscribe to the eLML Newsletter here. (June 1st 2004) Since the first phase of the GITTA project officially ended in June 2004, the former GITTA project coordinator Eric Lorup left the project and now works for an eLearning software company. We would like to thank him very much for his work and efforts during the last years. For the maintenance phase (see above) the new GITTA coordinator will be Joël Fisler, former GITTA developer. 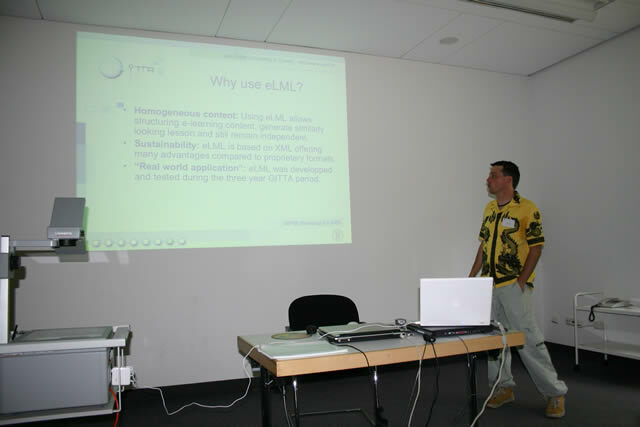 (May 2nd 2004) Based on the GITTA DTD, Susanne Bleisch and Joël Fisler realized the EduTech-financed XML framework eLML, the eLesson Markup Language. The GITTA DTD itself was created by Susanne Bleisch and Stefan Hofstetter based on the German LMML project. It was then, while in use for creating over 50 lessons, updated and simplified. In late 2003 EduTech proposed to offer a XML Framework based on the GITTA DTD for all interested SVC projects, which lead to the creation of eLML. In comparison to the old GITTA DTD, eLML is even simpler and lighter and is now based on XML Schema. Also we added extensive tutorials and an example lesson.